Larkin Square is home to two pickleball courts. Paddles and balls are available for use weekdays and when Larkin Square is open for public events. Feel free to play, we just ask that you please return the paddles and balls when you finish playing. Courts are available on a first come, first serve basis. Equipment is stored in a basket by the courts. Pickleball is played with a wooden paddle and a plastic whiffle ball. It is a combination of badminton, tennis, volleyball and ping-pong. Pickleball may be played as a singles or a doubles game. Here are a few simple rules to help get you started. The rules are also printed on our Larkin Square paddles. For a more detailed list of rules or to order your own equipment, visit the USA Pickleball Association’s website. Serve the ball underhand, diagonally, cross-court, bouncing inside the court beyond the non-volley zone. One foot must be kept behind the back line when serving. 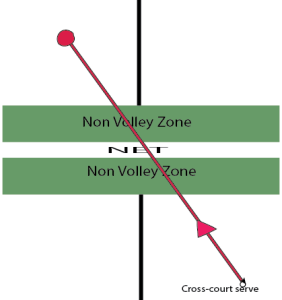 The ball must bounce once on each side after serving. Once it has bounced on both sides, the ball may be returned from a bounce or a volley. Players cannot hit a volley in the first seven feet from the net (non-volley zone). Points can only be scored when serving. A point is scored when the opponent faults by missing the ball, hitting it in the net or out of bounds, hitting a volley in the non-volley zone, or volleying the ball before it has bounced once on each side of the net. Only one service attempt is allowed (except in the event of a "let," when the ball touches the net and lands on other side). In doubles, each member of the serving team serves until they lose the service. Once both players have lost the serve, the service goes to the opposing team. At the beginning of a game, the serving side relinquishes the serve after first fault. A game is played to 11 points, win by 2.